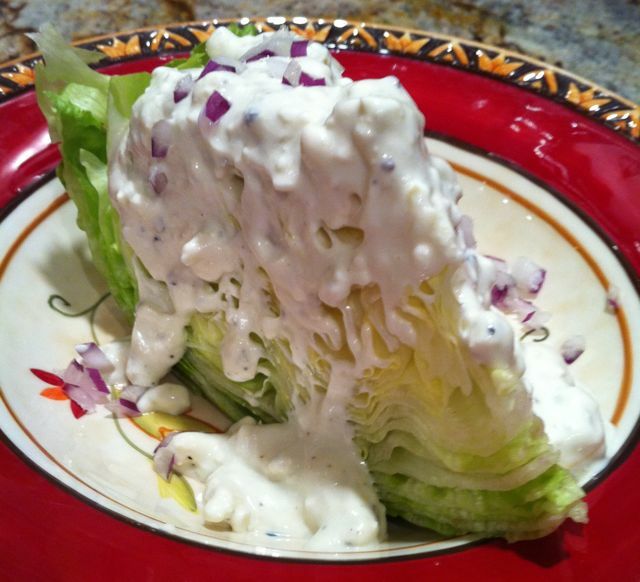 In the 1950’s the Iceberg lettuce wedge with blue cheese dressing was ubiquitous. It is now a cool retro food on many menus. I think of Cesar Chavez and the United Farm Workers who in the early 1970’s were picking the lettuce under miserable working conditions (no bathrooms, no water, no healthcare, petty wages). Chavez called for a boycott of iceberg lettuce. YES! We started eating Romaine lettuce, a great way to eat and be at one with the United Farmworkers. We can eat Iceberg these days, so I served my recipe last night. The Iceberg wedge with blue cheese dressing (gooey, lava-like, creamy, delectable) will take you to a place of nostalgia and hopefully solidarity. 1/2 cup red onion, small dice, placed in an ice-water bath for 30-45 minutes then drained of all excess water. Make a thoroughly smooth paste (no lumps) of the onion and garlic using a mortar and pestle. Combine the paste with all the other ingredients and whisk until well blended. Pour over each of the wedges and sprinkle with the diced red onion. Crunch, crunch — and excess of lavish blue cheese lava!